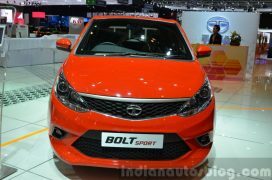 Popular Indian passenger car maker Tata Motors will announce a sporty variant of the Bolt at the ongoing 2015 Geneva Motor Show later today. Christened as the Tata Bolt Sport, the new variant gets a more powerful petrol engine and several visual updates, all of which come together to bestow the latest Tata hatchback with sense of athleticism. 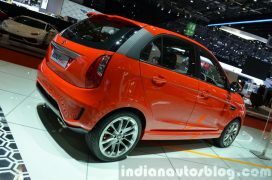 Here, in this post, we have come up with details and pics of the decidedly sporty hatchback from the Indian manufacturer. Check it out! Powering the Tata Bolt Sport is a re-tuned 1.2-litre Revotron turbocharged petrol engine that produces a max power of 120 hp @ 5,500 rpm and a peak torque of 170 Nm between 2,000 and 3,500 rpm. The engine comes mated with a Five-speed manual gearbox that sends power to the front wheels. The Bolt Sport gets disc brakes on all four wheels. The wheels measure 18-inch in diameter and are shod with 205-section low profile tyres. 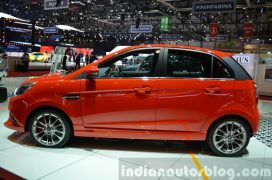 Much like the Bolt Revotron on sale in India, the Bolt that has been showcased in Geneva gets the Multidrive feature, which enables the driver to choose from Eco, City, and Sports modes. 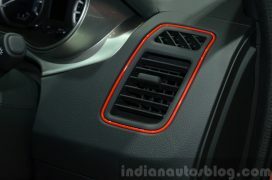 Basically, Multidrive offers three different throttle maps to change the way the Bolt behaves to the throttle inputs. Exterior visual updates for the new model include – new grille, body kit, projector headlamps, new rear bumper. 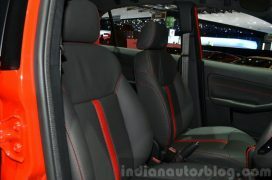 The interior the Bolt Sport comes draped in black leather upholstery with red contrast stitching and contrast accents. 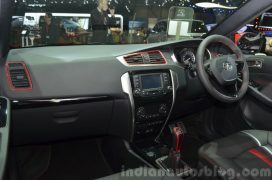 The car also gets a sunroof and the Harman touchscreen infotainment system gets voice recognition and SMS readout features. Safety kit for the Bolt Sport includes Dual Front Airbags, ABS and Corner Stability Control. 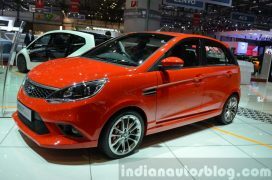 Stay tuned to Car Blog India for more on the new Tata Bolt Sport.